Mr. Durkin graduated from Chicago’s Leo High School in 1964 and received a Bachelor of Arts degree from the University of Notre Dame in 1968. In 1973, he received the degree of Juris Doctor from the University of San Francisco School of law. In his last year of law school, Mr. Durkin was the student advisor to the U.S.F. Criminal Law Clinic at the Marin County, California Public Defender’s Office. Mr. Durkin served as a law clerk to the Honorable James B. Parsons of the United States District Court for the Northern District of Illinois from August, 1973, to July, 1974. From August, 1974, to April, 1978, Mr. Durkin was in private practice in Chicago specializing in federal criminal cases, and tried a large number of jury cases as a panel attorney for the Federal Defender Program of the United States District Court for the Northern District of Illinois. From April, 1978, to March, 1984, Mr. Durkin served as an Assistant United States Attorney for the Northern District of Illinois under United States Attorneys Thomas P. Sullivan and Dan K. Webb. In his six years at the U.S. Attorneys Office, four and one-half years were spent in the Special Prosecutions Division, the section primarily responsible for the investigation and prosecution of the major white collar fraud and political corruption cases. Mr. Durkin investigated and prosecuted several of the cases involving systemic corruption in the Electrical Inspection Department of the City of Chicago, as well as two major Medicaid fraud cases and a variety of income tax evasion matters involving political corruption. He was also responsible for the investigation and prosecution of the first federal criminal civil rights open housing case in the Chicago area, which involved a racially motivated bombing in Burnham, Illinois. Mr. Durkin is a fellow of the American College of Trial Lawyers. He also teaches National Security Law, and is the Distinguished Practitioner in Residence at Loyola University Chicago School of Law, where he serves as Co-Founder and Co-Director of its National Security and Civil Rights Program. Mr. Durkin is also a Senior Research Fellow at the Fordham Law School Center on National Security in New York City. Mr. Durkin has been on the faculties and taught Trial Advocacy for a number of years at: The John Marshall Law School; Loyola University; The National Institute of Trial Advocacy; and the U.S. Department of Justice Attorney General’s Advocacy Institute. In 2008, he served as a guest lecturer at the Duke University School of Law and the Duke Law Guantanamo Defense Clinic. In 2009, he was a guest lecturer on Guantanamo Bay and National Security Law at the University of Notre Dame and The John Marshall Law Schools. In February 2010, Mr. Durkin was a guest lecturer at the Duke University School of Law Counterterrorism Law and Policy Seminar, and the University of Chicago Law School’s International Law Society. In 2011, Mr. Durkin lectured at the University of Notre Dame’s National Security Project and presented a paper entitled: A View From Guantanamo to the Homeland: Counterterrorism War Rhetoric and the Conflation of the War on Drugs With the War on Terror. In 2011, Mr. Durkin was a panelist at the Notre Dame Law School’s Third International Law Symposium titled Terrorism After Bin-Laden. His paper, Apocalyptic War Rhetoric: Drugs, Narco-Terrorism, and a Federal Court Nightmare From Here to Guantanamo, was published in the Notre Dame Journal of International & Comparative Law; Vol II, Issue II, Spring 2012. In 2013, Mr. Durkin also served as a panelist as part of the National Association of Criminal Defense Lawyers’ NSA/FISA national webcast series entitled: “The NSA Leaks: FISA 702 and PATRIOT 215 Litigation Strategies.” Mr. Durkin also served as a featured panelist for the Union League Club of Chicago program celebrating the 150th Anniversary of the Gettysburg Address. In 2014, Mr. Durkin lectured at the Columbia Law School in New York City, and also served as a panelist for the Chicago Bar Association’s Human Rights Committee special seminar entitled: “Individual Privacy vs. National Security.” Also in 2014, Mr. Durkin was a panelist at the Valparaiso University Law School Law Review Symposium, National Security: Up Close and Personal. His Symposium Article, Permanent States of Exception: A Two-Tiered System of Criminal Justice Courtesy of the Double Government Wars on Crime, Drugs & Terror, was published in the Valparaiso University Law Review. See, 50 Val. U. L. Rev. 419 (2016). Mr. Durkin has been admitted and serves as a member of the U.S. Department of Defense Pool of Qualified Civilian Defense Counsel to Practice Before the Military Commissions in Guantanamo Bay, Cuba; and presently serves on the National Association of Criminal Defense Lawyer’s Select Committee on National Security. He also has served as a member of the Advisory Committee of the Center for Civil and Human Rights of the University of Notre Dame Law School. Mr. Durkin also continues to serve as a panel attorney for the Federal Defender Program, Inc., for the United States District Court for the Northern District of Illinois in Chicago; and is a member of the National Association of Criminal Defense Lawyers, the American Bar Association’s Committees on Criminal Justice and International Law, the Illinois State Bar Association’s Human Rights Section Council and the Union League Club of Chicago’s Public Affairs Subcommittee on the Administration of Justice. He is also a past member of the Board of Directors of the Illinois Attorneys for Criminal Justice and the Board of Directors of the John Howard Association. Mr. Durkin and his firm’s pro bono efforts to defend several Guantanamo Bay detainees have attracted national attention and praise. 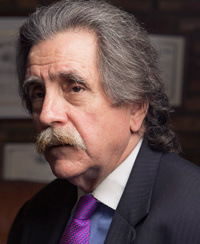 He served as counsel, along with the Center for Constitutional Rights in New York City, for two detainees at Guantanamo Bay who have since been returned to their home countries, for which he and his firm, along with all other Guantanamo counsel, received the 2007 Frederick Douglass Human Rights Award from the Southern Center for Human Rights. 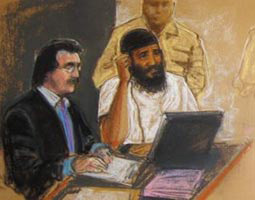 Mr. Durkin was also selected in 2008 to be a participant in the John Adams Project, a joint effort of the American Civil Liberties Union and the National Association of Criminal Defense Lawyers to provide civilian defense counsel to assist the military lawyers in the trial of the five High Value Detainees charged in U.S. v. Khalid Sheikh Mohammed, et al., in the Military Commissions at Guantanamo Bay, Cuba with conspiring to orchestrate the September 11th attacks of the World Trade Center and Pentagon. Mr. Durkin was civilian counsel for defendant Ramzi bin Alshibh. In September of 2008, Mr. Durkin was awarded the Constitutional Rights Foundation Chicago’s Bill of Rights in Action Award for his work in preserving the Constitution in the representation of detainees at Guantanamo Bay. Among his other notable cases, in 2016 Mr. Durkin attained a forty month sentence for Mohammed Hamzah Khan, an eighteen-year-old suburban Chicago man who was charged with providing material support to ISIS by attempting to travel to Syria along with his two juvenile siblings. The case attracted national attention and resulted in a feature story on Mr. Durkin in the Wall Street Journal. See, [https://www.wsj.com/articles/a-terror-suspects-best-hope-in-court-1481735889]. In January of 2014 Mr. Durkin represented Jared Chase, one of the NATO 3 defendants, in the first prosecution under Illinois’ terrorism statute, wherein the three defendants were acquitted on all terrorism charges. In 2012, Mr. Durkin represented a group of University of Chicago graduate students arrested following the mass arrests of the Occupy Chicago protesters in Grant Park. In a thirty-seven page ruling, Associate Judge Thomas Donnelly ruled the October 2011 arrests violated the protesters First Amendment rights. In 2009, Mr. Durkin represented Bobby DeLaughter, the former Hinds County, Mississippi, Circuit Judge in an “honest services” mail fraud case pertaining to alleged judicial misconduct. Judge DeLaughter had previously successfully prosecuted Byron De La Beckwith in the murder civil rights leader Medgar Evers. All mail fraud and public corruption charges against Judge DeLaughter were dismissed. In May of 2008, Mr. Durkin obtained an acquittal on all counts for Michael J. Mahoney, the former Executive Director of the John Howard Association, on charges of bribery involving health care contracts with the Illinois Department of Corrections. In the summer of 2006, he represented Robert Sorich, the Deputy Director of the Mayor’s Office of Intergovernmental Affairs, in a widely publicized and controversial “honest services” mail fraud patronage prosecution in the federal court. In addition to these matters, Mr. Durkin also represented Dr. Abdelhaleem Ashqar on federal charges in Chicago pertaining to allegations with respect to providing material support to the Specially Designated Terrorist Organization, Hamas; and he was lead trial counsel for Matt Hale, the self proclaimed Pontifex Maximus of the World Church of the Creator, an avowed white supremacist organization, on widely publicized domestic terrorism charges that Hale solicited the murder of U.S. District Court Judge Joan H. Lefkow. In August of 2002, on behalf of former Town of Cicero Treasurer, Joseph DeChicio, Mr. Durkin obtained the only acquittal in the very highly publicized federal criminal case of United States v. Spano, et al., an eight defendant public corruption trial involving the Town of Cicero and its President, Betty Loren-Maltese. He also served as co-counsel for the Global Relief Foundation, Inc., of Bridgeview, Illinois, one of the Islamic charities whose assets were blocked after September 11, 2001, under provisions of the U.S. PATRIOT Act by the Treasury Department’s Office of Foreign Assets Control. Mr. Durkin also served as lead counsel for Jason Powell in an Indiana capital murder case that attracted national attention into an alleged racially motivated shooting that occurred in November of 1999, in Elkhart, Indiana. In 1998, he served as counsel for one of the Chicago Police Officers charged in the corruption investigation into the Gresham Police District. In 1997, Mr. Durkin obtained an outright acquittal on behalf of Gary City Councilman, Frank Ballard, who had been charged in the United States District Court for the Northern District of Indiana with bribery and extortion allegations arising from the federal investigation of the Gary Sanitary District. He also served as counsel in the widely publicized 1996 federal trial in Chicago of the high ranking members of the Gangster Disciples street gang, and was also involved in the successful defense of several commodities traders in the highly publicized federal investigation of the Chicago Mercantile Exchange. In 1990, he obtained a not guilty verdict on all charges on behalf of William J. Stoecker, who was charged with federal bankruptcy fraud arising from the highly publicized Grabill Corporation bankruptcy. In 1985, he obtained the only acquittal in the federal investigation of the Lake County Indiana Court System in the defense of Attorney Thomas Mullins who had been charged with mail fraud, bribery and income tax investigation. Since September of 2010, Mr. Durkin has also been a Graduate Student at Large and Returning Scholar at the University of Chicago, concentrating on graduate Political Science and Divinity School courses at the intersection of his academic interests in religion and nationalism. He lives in Chicago with his wife and law partner, Attorney Janis D. Roberts.